It’s a pleasure fishing with customers who book with Traverse City Bass Guide Service. I enjoy meeting new people and sharing in their special day on the water as we fish for smallmouth bass on the beautiful world-class waters of Grand Traverse Bays. Occasionally, opportunities that don’t involve bass fishing present themselves that I love to pass along to my customers. Such an opportunity presented itself several days ago when there was a hard north wind for a couple of days in northern Michigan. Late summer typically means that salmon will make their way close to river mouths where they will run upstream to spawn. A hard north wind will often stack the salmon up in thick numbers, making them easy for boats not outfitted for trolling, such as a bass boat, to use techniques other than trolling to cast to, and catch, these awesomely powerful fish. In Traverse City, the Boardman River empties into West Bay. Adjacent to this river mouth is deep water, known as "the hole." Salmon congregate in large numbers in the hole, bringing with them a set of opportunities for catching them that doesn’t have to mean trolling from a large charter boat. While trolling this is a terrific technique enjoyed by many, others prefer a more hands-on approach. 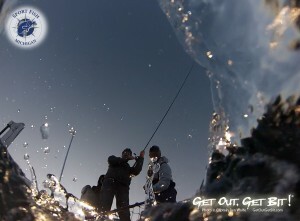 I am definitely one of those-enjoying the challenge and adrenaline rush of catching salmon with rod and reel in-hand. A few days prior to my bass trip with a couple of new customers, when I typically contact my customers, I knew that there would be an opportunity to vertical jig for king salmon in "the hole." My customer, Michael, seeking a thrill for himself and for his son, readily agreed that targeting salmon would be an interesting alternative to bass fishing. We agreed to meet in the pre-dawn hours, getting out early trying to hopefully take advantage of the first light bite. Early morning fishing requires caffeine if you’re me. In fact, for me, every day requires coffee-especially if you own a coffee company, which I do. Deep Blue Coffee Company supplies coffee to Traverse City Bass for its customers to enjoy during their trip, often eliminating a customer’s suffering through hotel coffee. They get to show up at the boat ramp, and I’ll have a great cup of coffee waiting for them. This day, I somehow forgot the coffee carafe, and sent my customer a text that I had dropped the ball and forgotten the coffee. "No worries," he said, "I don’t drink that much coffee anyway." Nevertheless, I felt terrible about my oversight. We launched the boat in the pre-dawn darkness, and headed down towards the hole in hopes of being able to hook up with some salmon by jigging Jonah Jigs, which were designed specifically for vertical jigging salmon. Armed with my G.Loomis jigging rods, we were rigged and ready for business! 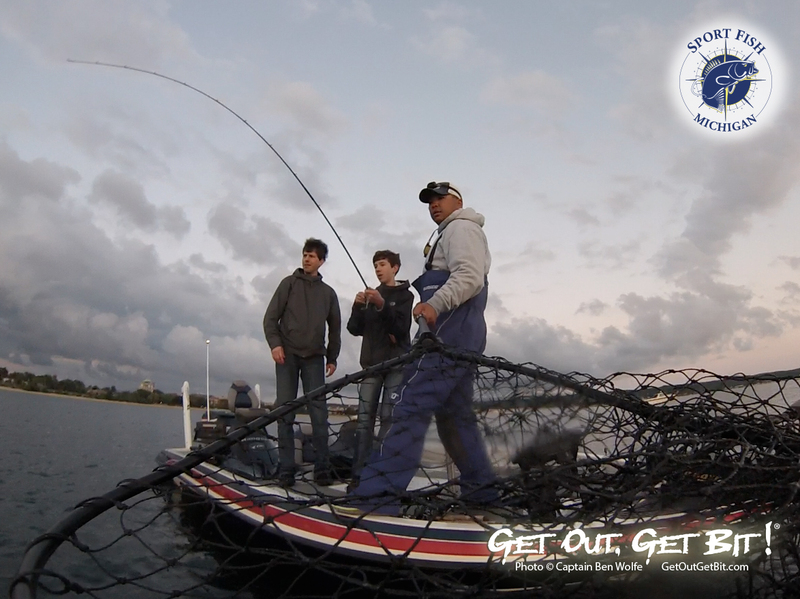 After showing my customer and his 13-year-old son the proper techniques for jigging, we began our day by looking for schools of salmon on my sonar. Bingo, there they were!!! "OK, drop guys!" By dropping our Jonah Jigs to the bottom and reeling up to the depth that the salmon were holding in I knew that we were in a good position to hopefully get bit in short order. It wasn’t long before I felt the telltale aggressive jolt from a salmon, but didn’t hook up. Shortly after my bite, Michael also got a bite, stopping his heart for a moment. "You weren’t kidding when you said that this was an aggressive bite!" Now we were on to something. No sooner had he finished sharing his experience about the sensation of the bite, he was hooked up, with drag peeling off of my Shimano reel. "Holy **Bleep**!" he shouted, "NO COFFEE NEEDED!!! THIS IS AWESOME!" After a 5-minute battle full of drag pulling and powerful thrashing on the surface, our king salmon was in the net, coming aboard for some photos. Perfectly hooked right in the jaw. 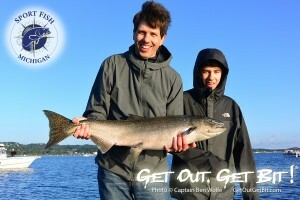 I’m pleased to say that we were able to boat 4 salmon, out of the 7 that we hooked up with. 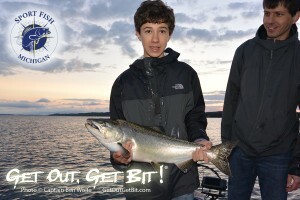 We had numerous other bites, including a dandy lake trout that Michael’s son, Justin landed. The entire time, Michael kept saying how exciting it was to catch a salmon with a technique that allowed him to feel the bite and fight the fish all on his own. It was a fantastic morning of fishing, and the added benefit was that they were able to take their catch home, something that we don’t allow when we bass fish. As a guide, it’s gratifying knowing that my customers had a day that far exceeded their expectations. And to be able to take advantage of a unique set of opportunities made it all that much more special. 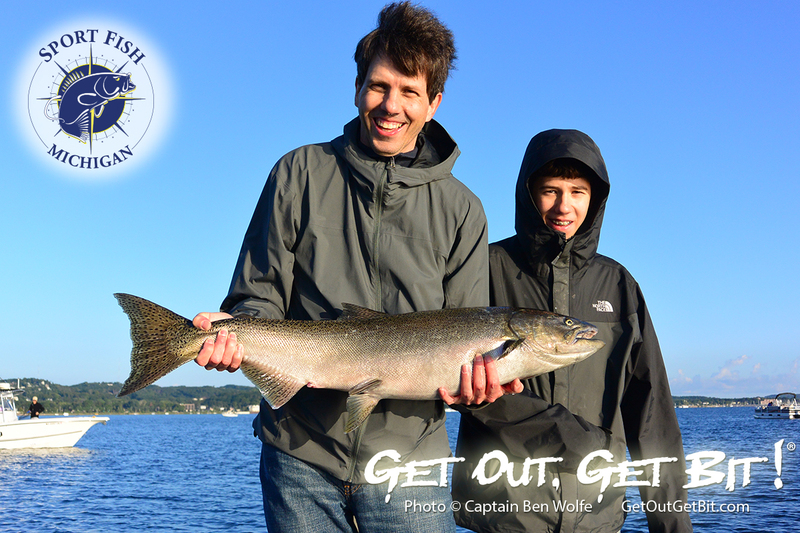 We can’t always jig for salmon, but when the circumstances present themselves…. Good things can happen!